Spray Tech / Junair paint booths are specifically designed to reduce energy consumption. Using booths with our retrofit equipment/accessories, specifically our patented QADs™ (Quality Air Drying) system, can further increase this efficiency by creating the ideal environment for waterborne base coats. The QADS™ system also reduces the overall drying and curing times during the bake cycle. We will explain further, how it’s done. Our paint booths are equipped with advanced control panel systems which enable the user to multitask using the mobile management technology (VPN – Virtual Private Network). The touch screen controlled operations make the whole process user-friendly. The operator can pre-select a pre-determined parameter or a combination of parameters in order to control the respective drying cycle. The pre-determined parameters may vary with respect to time depending upon the particular drying stage of the process. The tiered baking process helps the booth operator to run multiple bake cycles. The surface temperature is raised rapidly and can be maintained for a pre-determined time period. This helps quick drying of the paint with efficient curing results. The tiered baking process hence decreases the bake cycle time and ensures a high-quality finish. ‘Drying time’ is one of the most important factors in a busy paint shop. The lessor the drying time, the more the vehicles can be painted, hence generating more revenues. 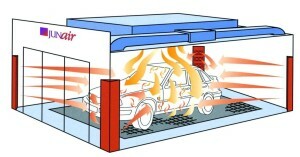 Paint booth operators sometimes make errors in setting the temperature and timelines of a paint job. This may affect the drying times and sometimes the whole drying process. Such errors may harm productivity of painted bodies and cost effectiveness of a drying operation. Paint Booth For Sale | Which One is Better?